This review of Classic Home Video Games 1989-1990 recently appeared on a video game website called Retro Collect. It was written by Tom Charnock, who received a review copy from the publisher. Brett Weiss is a man who loves lists. He also loves games, and it was only a matter of time before he combined these passions and nature took its course. 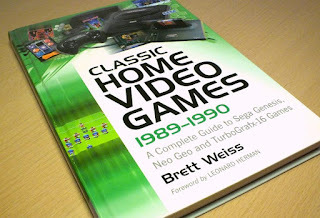 The product of several thousand hours’ worth of research, the Classic Home VideoGames series of books has been available for some time but it is only now that I’ve had the opportunity to get hold of a volume from the collection and see what all the fuss is about; and I must say it was definitely worth the wait. The Classic Home Video Games series spans every home console from 1972 up to 1990 and each entry is split into a certain period in video games history. If you’re reading this article now, the chances are that you collect retro video games in some capacity; or at least have an interest in the subject, and so this series of books is quite possibly something you’d be interested in knowing more about. AES were all released in the US. I make this pertinent point to use the NTSC-U monikers for these systems because this series of books is primarily focused on the American market, but regardless of where you live the sheer level of detail contained within the pages is astounding. Coming in both soft and hardback flavors, each entry the Classic Home Video Games series lays out the systems that were released in North America in that particular period (and are split into 1972-84, 1985-88 and 1989-90). Every chapter begins with an introduction and a short history of the console in question, and Weiss details his own experiences with each. 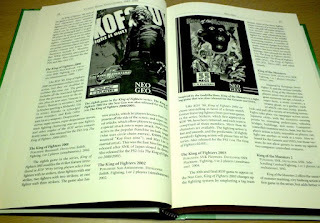 And this is really where the books differ from some other list-based publications – the author is an avid gamer and shares his personal opinions and experiences with each and every piece of hardware featured. Not only this – and here’s the money shot – the books go on to detail every single North American release for every system, and also feature paragraph-long reviews detailing good points and bad, gameplay mechanics and if there are any other versions of the game available. You’ll also find box scans and images of the consoles dotted throughout, and though these are in monochrome they are a welcome addition and break up the text nicely. release, and include a one line review to detail what the game is. You get the impression that Brett has spent a good chunk of his life investigating these carts, CDs and HuCards and he details his history with the hobby in the illuminating opening chapter. Sure, there are plenty of online lists – this very site has one of the most comprehensive databases anywhere online – but there is something about having a physical book that you can hold in your hands and flick through whenever you feel like it. Even more so when every game also comes with a mini review and is peppered with personal experiences and opinion. In closing, if you are a collector of Genesis, Neo Geo or TurboGrafx-16 games, I would wholeheartedly recommend this 300+ page tome not only as a worthy guide, but also as a great extra addition to your library of games-related reading material.